What Was the Stance of Monetary Policy Late Last Year? HomeBusinessWhat Was the Stance of Monetary Policy Late Last Year? In a fiat money world where the central bank has almost limitless ability to pump money into the economy, and impact the expected growth of nominal aggregates, what is the most useful definition of the stance of monetary policy? Since I believe that the Fed should target the expected growth rate of NGDP on a daily basis, I decided the most useful way to think of “easy money” was as a policy expected to lead to above-target nominal growth, and vice versa. Is this so unusual? I notice that those who favor targeting interest rates (Keynesians) define the stance of monetary policy in terms of interest rates. And I notice that many who favor targeting the money supply (monetarists) tend to define the stance of monetary policy in terms of the money supply. I prefer to target NGDP expectations. So that’s my policy indicator. What I think Sumner is saying is that no matter what the source of volatility in nominal spending, its the Fed’s job to counteract and stabilize it. In late 2008 the Fed should have been more aggressive in responding to the fall in velocity. By not doing so, Sumner is arguing monetary policy effectively was tight. I agree and have some evidence to support this view. My evidence is based on what I consider to be a useful metric for the stance of monetary policy. This metric is difference between (1) the growth rate of nominal spending in the U.S. economy and (2) the federal funds rate. 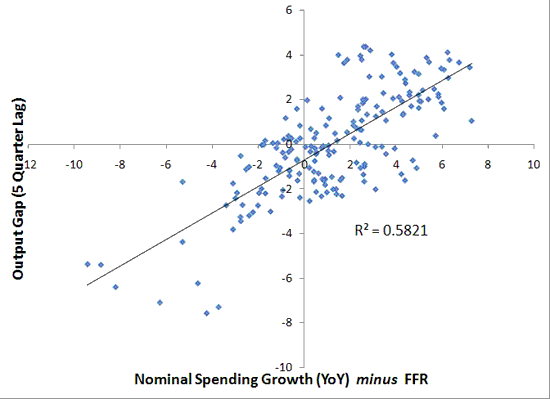 Using this metric, the federal funds rate should not deviate too far from the nominal spending growth rate otherwise monetary policy is either too loose (the federal funds rate is significantly below the nominal spending growth rate) or too tight (the federal funds rate is significantly above the nominal spending growth rate). So what does this metric look like? Using monthly nominal GDP as my measure of nominal spending I have constructed it as follows: the year-on-year percent change in nominal spending minus the federal funds rate. Here is what this series looks for the period 1993:1 – 2009:7. 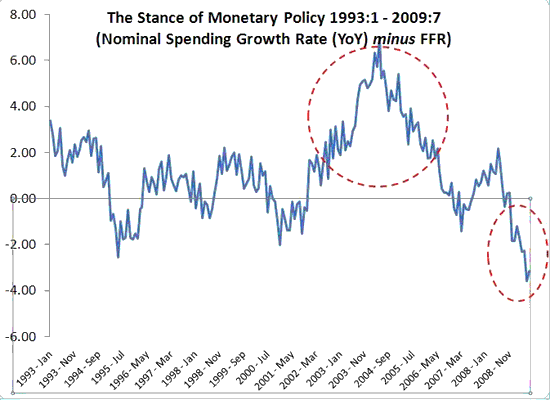 Note that I have highlighted two periods in red where there was a marked spread between the nominal spending growth rate and the federal funds rate. They just so happen to be the housing boom period and the mini-great contraction period Scott Sumner has been discussing. In the former case monetary policy was too loose while in the later is was too tight. There is surprisingly strong relationship here: almost 60% of the variation in the output gap 6 quarters ahead can be explained by current variation in this monetary stance measure. Monetary policy does matter–take note Arnold Kling–and its stance can be easily determined by this metric. *I used the output gap measure from John Williams et al. of the San Francisco Fed. See here for why it appears to be a better measure than the CBO’s output gap.